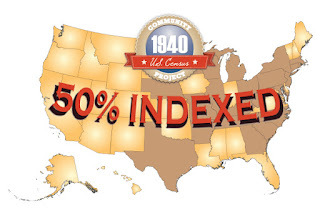 1940 Census More Than 50% Indexed! 1940 Census More Than 50% Indexed but not quite Georgia. So if you would like to help mosey on over to familysearch.org to help. Thanks to your efforts and those of more than 125,000 volunteers, the 1940 US Census Community Project reached the halfway mark one month ahead of schedule! Already, 75 million records have been indexed and 18 states and territories are searchable by name! We'd like to thank you with the image above that you may share or print. Also, to celebrate this milestone, we've created badges for each state that you have helped index or arbitrate. Go to familysearch.org/1940census/achievements, and sign in to see your achievements. Let's work together to index 100% of the 1940 US Census and make it freely searchable to the whole genealogy community!